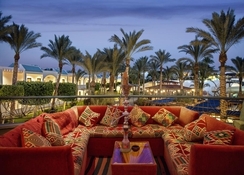 The award-winning, five-star Sultan Gardens Resort overlooks the picturesque Shark’s Bay in Sharm el Sheikh, Egypt. This luxurious, eco-friendly resort, set amid lush gardens and spectacular scenery, is a perfect holiday destination for families and couples alike. The elegantly appointed guest rooms offer all modern amenities, while the individually designed suites add that extra touch of luxury. 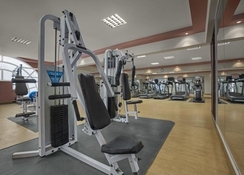 With 5 large outdoor swimming pools, two of which are heated, as well as basketball court, football court, volleyball court, kids’ club, gym, two tennis courts and an 18-hole mini gold course, the hotel provides all kinds of leisure and recreational activities. The hotel boasts 220 metres of private sandy beach, which is fronted by colourful coral reef, and an ideal spot for indulging in water sports, such as snorkelling, diving, windsurfing and parasailing. Guests can treat their palate at the hotel’s six delightful restaurants and multiple pool and beach bars, all of which serve top-notch food and drinks. Sultan Gardens Resort is located on the shore of Red Sea, in the beautiful Shark’s Bay, one of Sharm el Sheikh’s premier coral beaches. 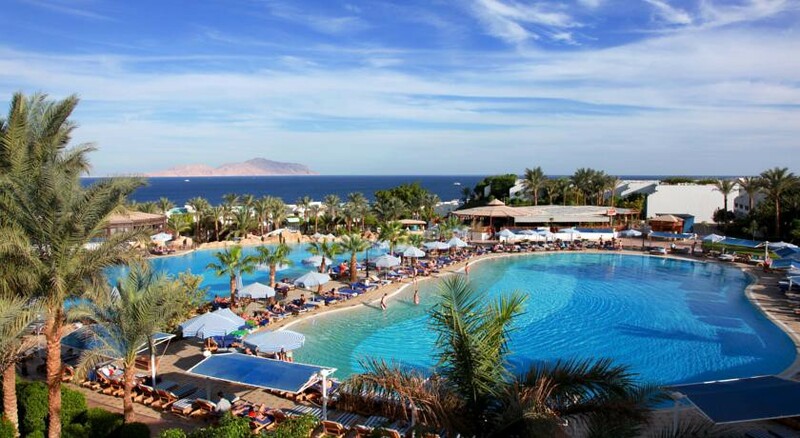 The scenic Tiran Island is in front of the resort and can be seen directly from the rooms. 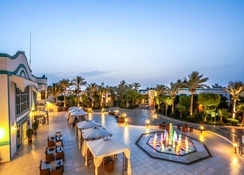 This luxurious resort isn’t too far away from the hustle and bustle – the restaurants, bars and vibrant nightlife of Naama Bay is just 7 km away. 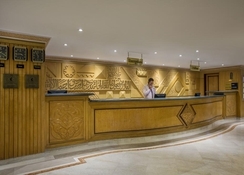 The Sharm el Sheikh International Airport is 6 km from the hotel. Next door to the hotel is an 18-hole golf course and across the street is located the Sharm el Sheikh botanical gardens. There are a host of other attractions, such as water parks, an equestrian centre, go kart racing tracks, ice skating rinks and the Ras Mohammed wildlife reserve that are a short bus or taxi ride from Sultan Gardens Resort. The 520 spacious rooms and suites at Sultan Gardens Resort are surrounded by gardens and offer five-star resort facilities. The accommodation options are divided into five categories: Select Rooms, Suites, Family Rooms, Villa, Premium Luxury Sea View Rooms and Premium Luxury Pool View Suites. Standard facilities in all the rooms are high-quality beddings, LCD TV with satellite connection, furnished private balcony with sea, pool or garden view, same day laundry, 24-hour room service, Wi-Fi, individually controlled air conditioning, mini-fridge, coffee/tea maker, direct dial telephone and digital safe deposit. The rooms are wheel chair accessible and guests are also given the choice of smoking or non-smoking rooms. The individually designed luxury suites offer added amenities and luxury, as well as stunning sea views and private whirlpool baths for two. A clutch of 7 delightful restaurants serving varied cuisines constitute the dining scene at Sultan Gardens Resort. The main restaurant Linah serves buffet meals with theme dinners, while Dana is an adults-only restaurant with a la carte dining. The Italian restaurant Casa Mia dishes up delicious pastas and pizzas. The seafront Fish Market serves fresh seafood, which includes catch of the day, weekly seafood barbecues and all-you-can-eat shrimp nights. Fleur De Leis is the first Cajun steakhouse in Egypt, where prime cuts of steak are imported directly from the United States. House of Spice prepares Indian dishes, and the adults only Lord’s Inn serves contemporary cuisine, where guests can enjoy a bold cocktail menu and tasty selection of tapas. 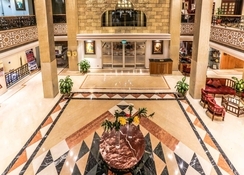 There are 7 bars and lounges spread throughout the hotel: Al-Dar Lobby Bar (open 24/7), Oasis Sports Pub, Sultana Pool Bar, Shallal Pool Bar, Rock Pool Bar, Tiran Beach Bar and Rehana Quiet Beach Bar. The best attraction of Sultan Gardens Resort is its private beach framed by the gorgeous Red Sea - a paradise for snorkelers and divers, as well as other water sports such as windsurfing, canoeing, parasailing, banana boat and wakeboarding. The hotel has a professional PADI-certified diving centre where guests can take diving lessons. There are 5 large swimming pools (including heated ones) furnished with cabanas, sunbeds, recliners and parasols. 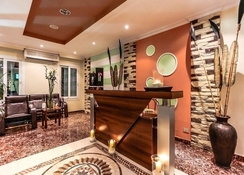 The Elysium Spa offers massages, body therapy, hammam, hairdressing and beauty treatments. A list of sports facilities for both kids and adults are on offer, including beach volleyball, football, basketball, fitness centre, yoga, aerobics, step aerobics, water aerobics, tennis (chargeable), mini golf and badminton. There’s also a huge 18-hole golf course next door to the hotel. The young guests can enjoy at the kids’ pool and the mini club complete with jungle gym, swings and slides. Also on the entertainment list are day-time animation programmes and evening entertainment such as live music, dance and nightly shows at the open-air theatre. The Golden Club Disco hosts themed nights and a weekly White Party. Due to some ongoing renovation processes their is no longer use of Tunis Court.